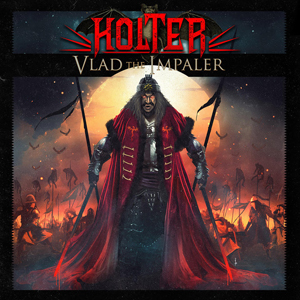 Frontiers Music Srl is thrilled to announce the release of HOLTER's Vlad the Impaler on November 9, 2018! The first single and video, “I’ll Die for You” is available now and you can check it out on KNAC.COM HERE. An exclusive, very limited edition version album of the album is available on red colored, 180g vinyl HERE. Born as a one-off musical extravaganza between two Norwegian metal and hard rock giants, Trond Holter (ex WIG WAM) and vocalist Jorn Lande, the DRACULA ROCK OPERA has now morphed into a full-time musical project with guitarist, producer, and songwriter Trond Holter at the helm. "The first round of the DRACULA ROCK OPERA was, in terms of live shows, only half the story with about 45 minutes of music. So, I added some additional songs for the live shows in Norway, which completed the story,” tells Trond Holter. "It was my intention all along to make this into a big show, even if it took some years to complete. When I started working on the songs for the new album, I found parts of them were outdated, so I rewrote parts of them and that inspired me to write new songs as well. It's a bit hard for me to say being so close to the material, but it's a few steps up the ladder sound wise. You can easily recognize the spirit of the first album, only with more energy. The Vlad the Impaler album was made to fill out the musicals being performed for the first album, so it is in fact pretty much the sophomore album from DRACULA." The result of this new inspiration is Vlad The Impaler. Vlad, also known as Vlad Dracula, was Voivode (or prince) of Wallachia three times and is the historical figure that inspired the famous legends about Dracula. With an outstanding line-up featuring singers Nils K Rue (PAGAN'S MIND) and Eva Iselin Erichsen, Bernt Jansen on bass, Per Morten Bergseth on drums, and Erling Henanger on keyboards, Vlad The Impaler starts where “Swing Of Death” left off. Musically, it is an album that gets straight to the point while simultaneously utilizing diverse musical landscapes and includes catchy and melodic songs in a similar style to it's predecessor. Think SAVATAGE meets MEAT LOAF meets QUEEN meets ALICE COOPER with contemporary hard rock in the mix and you'll have a sense of what's in store. "We all know Nils K Rue's great work with PAGAN'S MIND. The vocals and theatrics he delivers both live and on record are simply amazing! And the higher he gets, the better he sounds!! I came across Eva Iselin Erichsen in 2016 and later, when I got the chance to have her audition, I was blown away. She's all over the place, live and on record, giving everything that she's got. She is an amazing singer and a real star in the making. We are ready to take the whole Rock Opera live across the European continent!” concludes Trond. The album will be presented in the live setting in Halden, Norway with a special release show on November 10th. More shows are in the works including an appearance in spring at Karmøygeddon Festival (May 3, 2019). Without a doubt, Vlad The Impaler is going to be one of the highlights of the heavy metal genre in 2018. Enjoy!